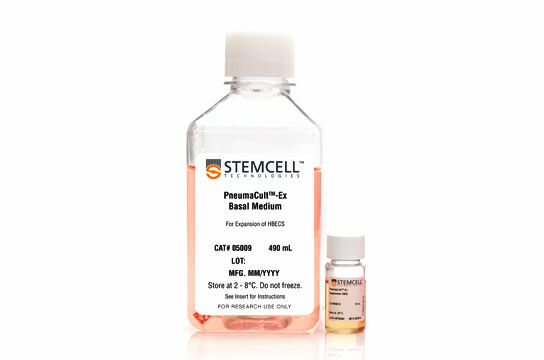 PneumaCult™ is a serum- and bovine pituitary extract (BPE)-free culture system that supports the expansion and differentiation of human airway epithelial cells. Use PneumaCult™-Ex Plus or PneumaCult™-Ex to expand airway epithelial cells in submerged culture. Use PneumaCult™-ALI to achieve extensive mucociliary differentiation at the air-liquid interface (ALI) or in airway organoid culture. Cells expanded and differentiated with the PneumaCult™ system retain key features of the in vivo airway epithelium such as a pseudostratified mucociliated epithelial cell layer consisting of goblet cells, basal cells and motile cilia. ALI cultures provide a physiologically relevant model for studying respiratory biology, infection and disease. In vitro models of the human airway using primary nasal, tracheal, or bronchial epithelial cells are instrumental in studying basic and applied aspects of airway biology and disease. 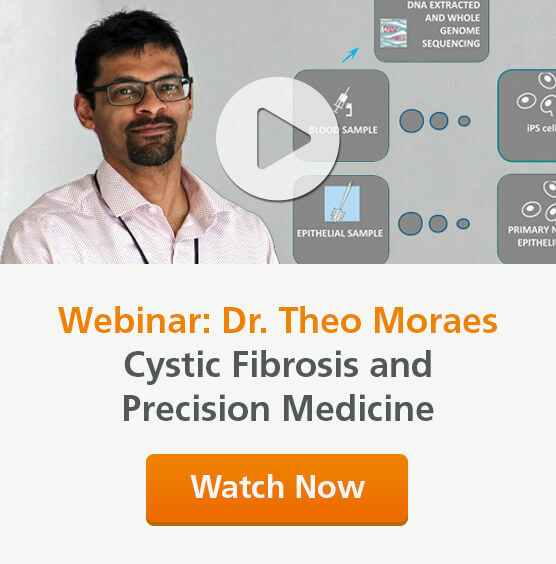 Learn how PneumaCult™-ALI is optimized for ALI differentiation to recapitulate the pseudostratified mucociliary phenotype observed in vivo. Cystic Fibrosis (CF) is a genetic disease that results in progressive dysfunction of the lungs and other organs. ALI cultures of primary human airway epithelial cells are well-adopted in the CF research field to model the airway. Learn how PneumaCult™-Ex Plus and PneumaCult™-ALI together support robust expansion and differentiation of CF airway epithelial cells at the ALI, especially after extended passaging. PHYSIOLOGICALLY RELEVANT. Primary human airway epithelial cells differentiated with PneumaCult™-ALI closely model the human airway. REPRODUCIBLE. Defined and BPE-free PneumaCult™ media formulations maximize experimental reproducibility. USER-FRIENDLY. Simple and optimized protocols make PneumaCult™ media easy to use. Bovine pituitary extract (BPE) is an undefined component used in several types of serum-free medium. However its presence can lead to experimental variability. Removing BPE reduces the variability and maximizes experimental reproducibility. The PneumaCult™ system has been formulated to be BPE-free while maintaining the highest possible performance of the media. See the results when PneumaCult™-Ex goes head-to-head with a BPE-containing medium. Current feeder-free expansion media for culturing primary human airway epithelial cells can only support a limited number of passages while maintaining robust mucociliary differentiation potential. Unfortunately, this limitation restricts the number of experiments researchers can perform using primary cells. 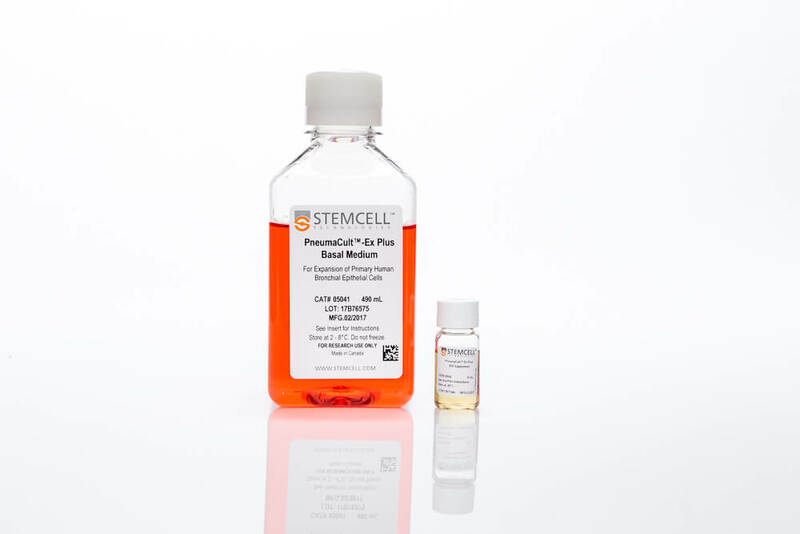 PneumaCult™-Ex Plus is a feeder- and BPE-free culture medium that puts an end to this limitation: researchers can expand cells for a higher number of passages during expansion culture, while maintaining mucociliary differentiation potential during the subsequent ALI culture. Ultimately, PneumaCult™-Ex Plus enables researchers to perform more experiments with a single sample. See the results when PneumaCult™-Ex Plus goes head-to-head with other commercially-available expansion media. Expansion of human bronchial epithelial cells (HBECs) in submerged culture is performed with PneumaCult™-Ex Plus or PneumaCult™-Ex. During the early “Expansion Phase” of the ALI culture procedure, PneumaCult™-Ex Plus or PneumaCult™-Ex is applied to the apical and basal chambers. Upon reaching confluence, the culture is air-lifted by removing the culture medium from both chambers, and adding PneumaCult™-ALI to the basal chamber only. Differentiation into a pseudostratified mucociliary epithelium is obtained following 21-28 days of incubation and can be maintained for more than one year. Müller L et al. (2013) Culturing of human nasal epithelial cells at the air liquid interface. J Vis Exp (80): e50646, DOI:10.3791/50646. Tata PR et al. 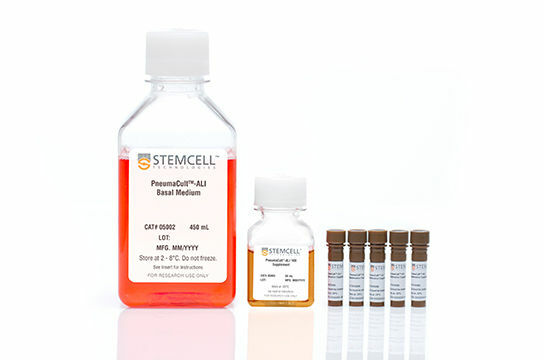 (2013) Dedifferentiation of committed epithelial cells into stem cells in vivo. Nature 503(7475): 218-23. Malik Z et al. (2015) Staphylococcus aureus impairs the airway epithelial barrier in vitro. Int Forum Allergy Rhinol 5(6): 551-6. Reeves SR et al. (2015) Fibroblast-myofibroblast transition is differentially regulated by bronchial epithelial cells from asthmatic children. Respir Res 16: 21. Xu J et al. (2015) Expression of surfactant protein D in airways of asthmatics and interleukin-13 modulation of surfactant protein Din human models of airway epithelium. Respir Res 16: 26. Reeves SR et al. (2014) Asthmatic airway epithelial cells differentially regulate fibroblast expression of extracellular matrix components. J Allergy Clin Immunol 134(3): 663-670. Solleti SK et al. (2015) Airway Epithelial Cell PPARγ Modulates Cigarette Smoke Induced Chemokine Expression and Emphysema Susceptibility In Mice. Am J Physiol Lung Cell Mol Physiol. Epub ahead of print, DOI: 10.1152/ajplung.00287.2014. Cao X et al. (2015) Tight junction disruption by cadmium in an in vitro human airway tissue model. Respir Res 16:30. Schamberger AC et al. (2015) Cigarette smoke alters primary human bronchial epithelial cell differentiation at the air-liquid interface. Sci Rep 5:8163. Schamberger AC et al. (2014) Cigarette Smoke–Induced Disruption of Bronchial Epithelial Tight Junctions Is Prevented by Transforming Growth Factor-β. Am J Respir Cell Mol Biol 50(6): 1040-52.